First tattoo, huh? First off, congrats on the tat. Second off, let's take care of that burning, itching, possibly infected fresh piece of real estate on your body. Tattoo geniuses created wonderful tattoo lotion to prevent any damage to your beautiful body artwork. So don’t risk infection and let’s go and find you some perfectly soothing cream to lather up on. 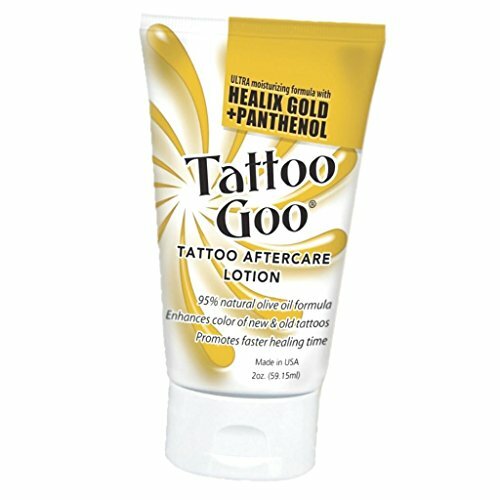 What Makes a Good Tattoo Lotion? 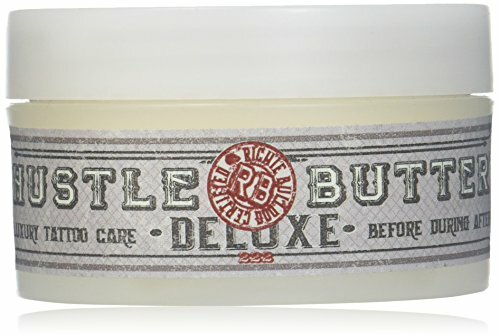 Hustle butter is the best tattoo lotion. Period. This lotion not only reduced redness on your affected skin but also leaves it feeling soft and smooth. The lotion has a two-stage process of softening skin and then healing it afterward to avoid any infection. You’re also looking at a vegan lotion composed of 100% vegan ingredients. Treat yourself to Shea, Mango, Aloe butter, Coconut, Sunflower, Rice Bran oils, Rosemary Oleoresin, Green Tea, Vitamin E Complex and Mint Arvensis Essential Oil, as well as Papaya and Coconut. For first timers, this lotion is perfect for you since you can keep on applying even after your skin has healed, due to its fantastic moisturizing capabilities. If you’re looking for a great product with easy, application that will help give color to your tattoo over time, Hustle Butter is your top pick. 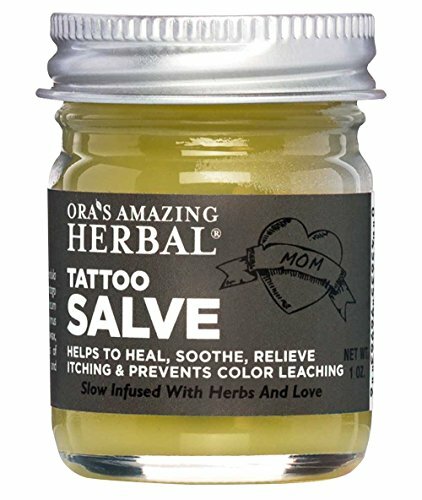 Tattoo Salve is the perfect eco-friendly lotion only consisting of ​natural healing herbs. It not only heals any red or infected areas of skin after you get inked, but it also works to keep petroleum off and out of your body. Without the harmful effects of more chemical based lotions, you can keep using this lotion for months after your tattoo has healed to promote healthy skin and a more colorful tattoo. Hate having lotions stick to your clothes and turn into a sloping mess? You’re in luck. After Inked Moisturizer not only treats your affected tattooed area but doubles as the perfect skin moisturizer afterward. If you’re looking for a healthy, chemical-free version of tattoo lotion, this is a win-win for you. This lotion is not only free of any harmful chemicals that could clog up your pores, but it is also dermatologist tested to be completely free of allergens and irritants. If you don’t believe us, this product has been recommended by the most well-known tattoo artists! 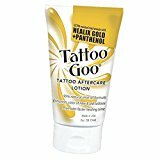 Tattoo Goo is a non-animal tested, fragrance-free, non-greasy tube of healthy healing lotion to help your infected, itchy, peeling skin. Although it sells in small bottles, this lotion is no small product. It is perfect for daily moisturizing including your face and body. This will not clog your pores, and unlike most chemical based lotions sold in stores, it contains no alcohol, lanolin, mineral oils, or irritating fragrances. Instead, Tattoo Goo is composed of healing herbs to prevent any further damage to skin, especially treating the tender parts of your tattoo. This lotion is among the best vegan-composed healing lotions on the market. This means it is free of gross chemicals that may further irritate your tattoo, such as alcohol and petroleum. All tattoos lotions are meant to moisturize and heal your skin, this one takes the cake on both. It also doesn’t simply glop on your skin and get on your clothes like most store brand tattoo lotions. This lotion has multipurpose features, reducing scabs, keeping your tattoo’s color vibrant, and keeping your skin hydrated and clean. After your tattoo is complete, you may think that you are good to go and show off your new tat. This could not be further from the truth. There is a whole aftercare process that must be taken seriously in order to ensure your health, safety, and the well-being of your new tattoo. It is extremely common for people to experience discomfort after they get a new tattoo. Since tattooing involves scarring the skin, this can be expected. Most people experience symptoms like dryness, itching, swelling, soreness, and scabbing. This is where tattoo lotion comes in. A good tattoo lotion alleviates the symptoms associated with new ink as well as protect the tattoo itself. Scratching can cause visible scars on your skin and ruin your new tattoo that you just spent so much time and money on. Tattoo lotion should be applied to the skin after you are allowed to take off your bandage. This will soothe the area and greatly reduce irritability. Tattoo lotion and cream are recommended for anybody with a tattoo, no matter how experienced they may be. Trust us, your tattoo will thank you. The best lotions for tattoos contain gentle and natural ingredients. These ingredients greatly reduce the risk of additional irritation and skin aggravation. Good lotions should not feel sticky either. They are meant to moisture the skin to help speed up the healing process. Look for lotions that contain vitamins A and D. These vitamins help to decrease irritation and keep your tattoo’s color vibrant and clear. Vitamins A and D will also help to keep your skin moisturized for the entire healing process. There are certain ingredients that you should avoid at all cost. Your tattoo is, after all, an open wound and can very easily be irritated. These bad ingredients include fragrances, alcohol, and aloe vera. These ingredients will often make the discomfort you are feeling even worse. People with very sensitive skin should also avoid vitamin E as this ingredient can occasionally cause irritation. You also want to stay away from lotions that contain pore-clogging ingredients. Your tattoo must be exposed to air in order to heal quickly and properly. Using a lotion that will clog your pores can slow the healing process, increase the likelihood of an infection, and damage your new tattoo. Stay away from petroleum and lanolin based lotions. Look for options that are described as noncomedogenic. You will be able to tell immediately if you are having a bad reaction to a certain lotion. You will feel increased discomfort or an increased burning sensation. You may also notice raised bumps on the area that resemble small pimples. If any of this happens to you, call your tattoo artist or a doctor to get a suitable recommendation. Poor tattoo care can be extremely dangerous not just to your tattoo but your well-being as well. As long and thoughtful the process of picking the kind of tattoo to get, none of that will matter if you misplace your care in the healing process afterward. Lack of care can lead to infections, dry skin, and you might even need surgery to repair the damaged skin. To better treat your tattoo try using tattoo lotions to treat the tattooed skin and to moisturize it. Another great way to keep your tattoo from any damage is to apply a good dose of Vitamins A&D ointment to handle bacteria buildup and to unclog pores from any excess ink. Aside from the short-term car of natural tattoo lotion, you also have to plan for long-term care. There are plenty of aftercare products on the market, from lotions to moisturizers. However, no matter what differences they may say they all serve one purpose. They are designed to keep your skin moisturized and keep the same vibrant color in your tattoo since you first got it. The last thing you want is faded tats especially when you get older. Tattoos are a life-long investment and are so much more than just a glob of ink on your skin. Never take your bandage off within 3 hours of getting your tattoo. Always pay attention to the time frame your tattoo artist gives you, no matter how excited you are to see it. You bandage isn’t only protecting your skin from infection, but also making sure the ink dries before you expose it to outside elements. Wash, wash, wash. Always wash your tattoo with an antibacterial soap at least 3 times a day for the first few weeks. Always remember, never wash your tattoo with unwashed hands. That’s how infections start. In the first few weeks be sure to wear loose fitting clothing. When your clothes chafe against your new tattoo, it can cause scabbing which may ruin your tattoo’s design. Best bet is to keep the skinny jeans or muscle shirts to a minimum and sleep on the side which your tattoo isn’t on to prevent chafing while you sleep. Don’t let water touch your tattoo! Showers are absolutely fine, but pools are full of chlorine which can seriously damage your new body art. Avoid gyms or hot tubs especially, since sweating can damage the extensive healing process. No picking. It doesn’t matter how badly you want to, you can cause a serious infection or possibly ruin your tattoo. Don’t live with regrets. That's ​a wrap on our review of the best lotion picks for keeping your tattoo ​fresh and pain-free. Of course, it's impossible to ​guarantee that you'll have ​completely no itching or pain after getting some ink done, ​but you should at least take some basic measures to ensure that your skin doesn't flare up or become infected. The Stages of the Tattoo Healing Process: Is This Normal!? !